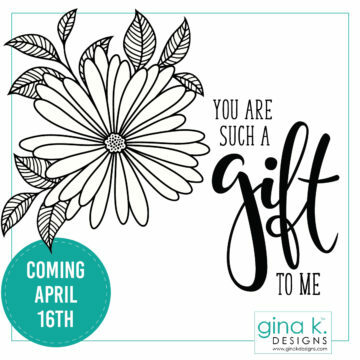 Video- Sneak Peek Floral Card with Rina K.
Just a spew alert! I am still laughing from this video! I promise you, watch it all the way through and you will not be disappointed, especially the twine! 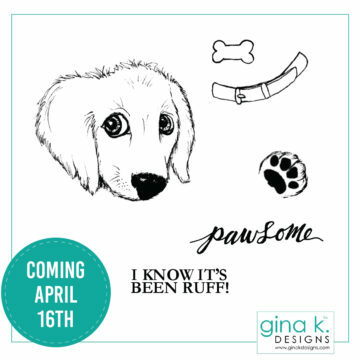 We also have a few sneak peeks of our new release coming Tuesday night, April 16th at 7:00 PM Central time to Gina K. Designs! Here is what we’ve shared so far! And here’s a early sneak peek, just for our blog readers! 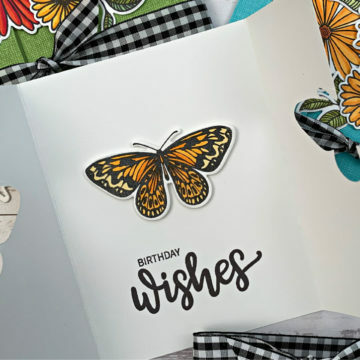 This is from the brand new Elegant Asters Card Kit! I will have several videos in the coming weeks featuring projects using this new kit! And there are more surprises too! 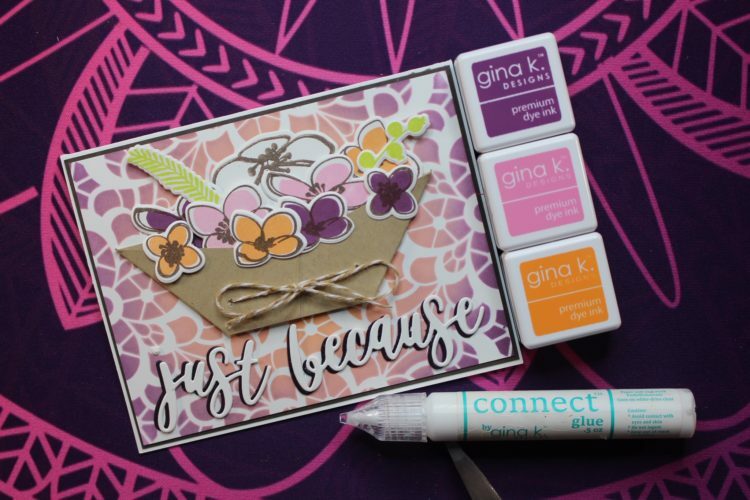 In the meantime, enjoy today’s inspiration and Happy Stamping! Love your originality in this card! Yes…it will probably snow at least once more in Minnesota before spring! My guess is it will probably snow in Minnesota again before your spring arrives. The weather is so unpredictable all over the nation. Love the…. foot! And dog! Oh, and the card too. And the sailboat flower holder. Not so much the dark, floral mat – harder to see All The Things. 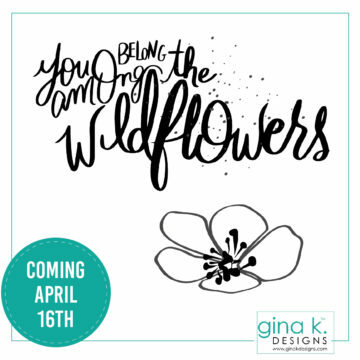 Gina, I love the last flower in your sneak peek cant wait!! I went to order some thing the other day and your on my cell phone but that number isn’t no good any more. Cute new floral set, looking forward to seeing the rest of the reveal. Beautiful card and great release!!! OMG, that Rina is just too much fun! Pretty darn creative, both in designs and implementing the tools on hand (or foot as the case may be). looking forward to seeing the kit. i love the kits i have purchased. i use them over and over and they never run out. 😀 The asters look so pretty. Unfortunately, I think it will snow at least one more time in Minnesota. I love your background, it’s beautiful. Those colors go together so well! Love your take on the card. Love the stencil, stamp and die. Yes it will probably snow before the weather really warms up. It is snowing here in upstate New York today. Yes, it will snow in Minnesota again and probably in Wisconsin too. Thanks for showing the dog and the love that is shared. We’re ready for all those spring flowers you showed today. I love your card! And yes, you all will probably have one more snow, I’m predicting this weekend. Weather has been so strange that I am sure that it will snow again. Hey, you might consider getting a tweezer that stays closes when you don’t touch it and then you press it and it opens. Works get for a third hand when trying to tie bows. EK Success sells one of these reverse grip design tweezers. I think it will snow!! We have had terrible weather and storms here in Texas. Absolutely wonderful video…I’m still giggling! “Oh, I got a text!. Oh, it’s only my mom”! LOL Awesome!! LOVE the foot!! This totally made my day!! LOVE, LOVE the stamp set, too! If Minnesota is anything like Calgary, where I live, it will, unfortunately, snow again. Love your entertaining videos Rina. No way snow is done. Spring is in the air!!!! All I can say is wow, you all have out did yourself a. I already ordered the wild flowers and astor new releases. Made sure I was on computer at 7.00. You all inspire me. I am still learning and these videos really help. I listen to them over and over again. Always get so excited to see the next video. Rina you are amazingly talented and have a great sense of humor. Just love your precious Mishka , so adorable. Hope I spelt her name correctly. I love watching all your video’s. Lisa, I think I own almost everyone of your stamp sets. I love flowers, and your such a great teacher. One day I would love to take one of your online classes. 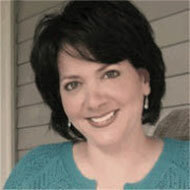 Your so fun to listen to with all your enthusiasm and bubbleness. I just made 3 cards using the flourish stamp and watercolor paper. I even got the Bee paper like you suggested. What a fun card . Actually made 5 but 3 only worked out. Love the rainbow over the flourish background stamp. Love, love your videos!! Gina, I hope I am leaving all these blogs in the correct place. I watched your preview of new release. 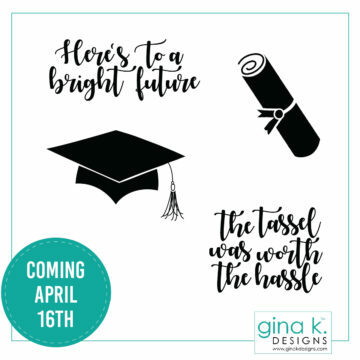 I already ordered my sets plus all re inkers. You are such a incredible teacher. Love listening to your videos and appreciate that you do it slower not fast speed so I can try and keep up. I have learned so much from you, you have no idea. 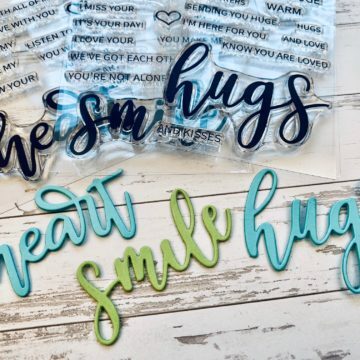 I definitely have the stamping crazies I have just put in two huge orders and still can think of stuff I want to buy. Lol definitely breaking the bank and enjoying every minute. Thank you for sharing your gift. Hi Melanie, I also own many of your stampsets as well. Your a great artist. I love listening to your videos. Looking forward to new and upcoming ones. I have tried recreating many of your stampsets from your videos . I think allot from Christmas. Just know I appreciate your hard work in making these videos for all of us to see. Thank you for sharing your God given talent. God Bless. Again, I have mentioned this before I hope I am blogging in the correct place. I have a hard time with technology. I’m still trying to figure out how to send in monthly challenge. Thank you again! To all artists, I do not want to leave anyone out. Love all of you an apprentice all your hard work and creativity. I know I own stampsets from each and every one of you. Some seems more than others but all of you. I just started scrappbooking in may summer or fall if last year. I turned my sons old room into my craft room and though I own stuff from other people, mostly, majority is all GIna K. Cannot get enough of all of you. What a great team!! Rina, Love your video. Yes it will snow again in Minnesota before spring.